Skate Cape May 2011: This is it! It was awesome to see that we were on 101.5 today! 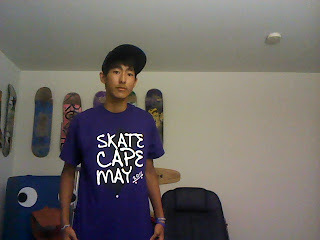 Skate Cape May begins in less than 12 hours! 11 hours, specifically! We'll be driving up to High Point State Park and we'll be there at 9:00 am, and we'll also be leaving the park at 10:00 am. If anyone wants to come to meet us or see us off, feel free! We'll be entering the park at 1480 State Rt. 23, Sussex NJ. We've also got shirts ready! Apologies for the poor quality, as it was taken with my laptop's webcam. They come in both purple and white, and they'll be for sale at our lemonade stands! Be sure to check them out and purchase one to help support the cause! There's not much to say, but there's so much to do! We're in for a long but most definitely exciting week! And don't forget to keep posted! We'll be posting video logs, videos, and pictures from each day!